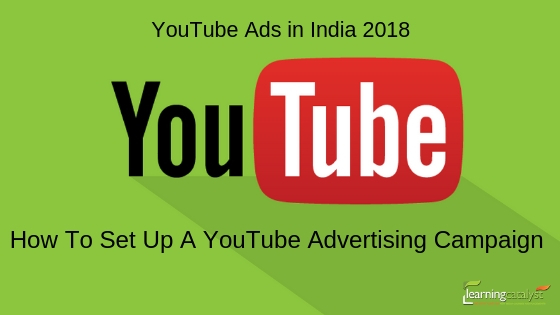 YouTube Ads are a great advertising option to consider in India as the rates of video engagement are one of the highest in India as compared to other countries. According to Your story, India now has 245 million (24.5 crore) Monthly active users on YouTube on just mobile phones. As India is a mobile-first nation this comes as no surprise. This growth is primarily due to the mobile revolution brought about by Reliance Jio which has made data packages affordable as well as freely available. The digital revolution has also fueled the demand for regional content. Today, about 95% of the content consumed in India is regional in nature and 75% of all data traffic is online videos. Even though YouTube is owned by Google, it is also well known as the second largest search engine in the world; the first of course being Google. This makes it an advertising platform which is hard to ignore. So, here’s what you need to know about setting up a YouTube advertising campaign in India in the year 2018. Bumper Ads last for a minimum of 6 seconds and are non-skippable in nature. They are short film-like in nature and make up for in terms of their effectivity. Google tested 300 ads in a year and found that 9 out of 10 bumper ads proved to be effective. This is why they are one of the most popular ad formats that are used today by brands. You can show your product in action, tell your story or show some behind the scenes videos with bumper ads. Take inspiration from these ads to create your own bumper ads. Display ads appear on the right side of YouTube searches. They appear above the recommended content column and you can use them to target a new audience who are using similar content as yours. The overlay ad appears when the user begins watching the video and can only be used if you wish to run your ad on desktop. File Formats: static GIF, PNG, JPG; animation can last up to 30 secs. A banner companion is optional and its dimensions are 300 pixels by 250 pixels. These ads can be skipped by the viewer after watching them for 6 seconds. Skippable ads are less of a distraction as the choice of watching the complete ad is up to the viewer which makes your role as an advertiser a little more challenging as it now becomes your responsibility to keep the viewer engaged till the ad is over. YouTube non-skippable ads can’t be skipped and are about 15-20 seconds long. You can also display a 300*60 pixel ad alongside your video ad if you are also running your ad on desktop. Adding cards to your video ads can help in making ads more interactive. You can include “Calls to Action” in your ads using cards. They expand when they are clicked on and look like an information icon on the screen. YouTube ads are much more affordable as compared to advertising on television. Most YouTube ads are charged on a “Cost Per View “basis. The price for YouTube advertising varies country wise and also depends on your niche. According to Blognlife, say for instance, in India, the CPM (cost per 1000 video views) rates for YouTube advertising are the highest for the “technology” niche. GST rates also apply which you will be charged for when you are billed. These are the rates offered by a leading advertising agency for YouTube advertising in India in 2018. You can refer to them here. Step1) Create a channel on YouTube. Step 2) Upload your ad video on your channel. 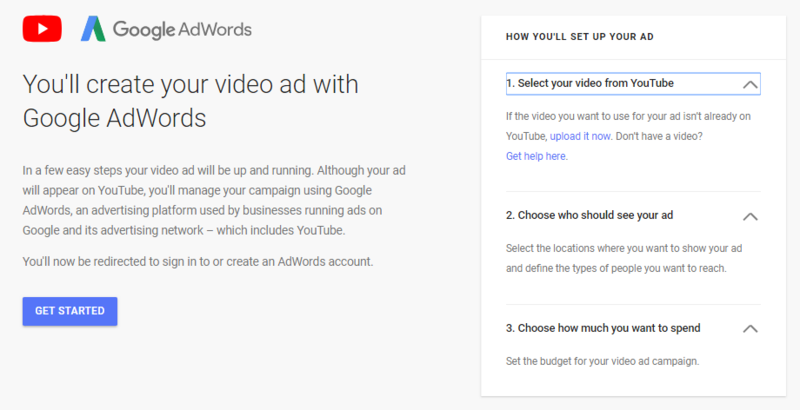 Step 3) YouTube ads are set up through the Google ads platform. Login into your Google ads account and click on the blue plus sign to create a new campaign. Step 4) When you select a campaign type, select the Video option. Step 5) Next select your campaign goal. Based on your campaign, there are 4 options you can choose from. You can also skip this step if you like and create a campaign without a goal. The most popular goals are lead generation and website traffic. Step 6) Name your campaign, select your campaign budget, start and end dates. This can be a daily figure as well as a total campaign budget. Here, you can also choose how you wish to spend your budget. Standard– Spends your budget evenly over the duration of the campaign. Accelerated– spends your budget as soon as possible. Preferably, select the standard option as the accelerated option might cause your budget to get over before the campaign ends. It is advisable, you start small and then gradually increase your budget based on the results you achieve. 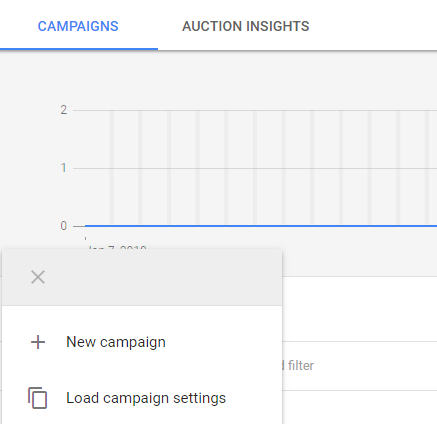 Based on your campaign goal, you can choose where your ads can run. YouTube Search results– If you are running video discovery ads, you can also choose to feature your ads in YouTube search results. YouTube Videos– Your ads can be shown on the YouTube homepage, channel pages and YouTube videos via this feature. This option is available for in-stream and video discovery ads. You can also opt to run your ads on the Google Display Network (GDN) which is a collection of sites and apps that have partnered with Google. This feature might help you in extending your ad reach. In-stream ads, bumper ads and video discovery ads can be used on the Google Display Network. 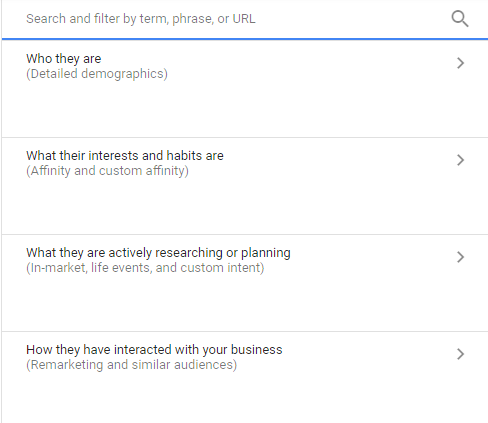 Step 8) Next, you have the usual targeting options where you can choose to target by the languages your target audience speaks and the locations you wish to target. 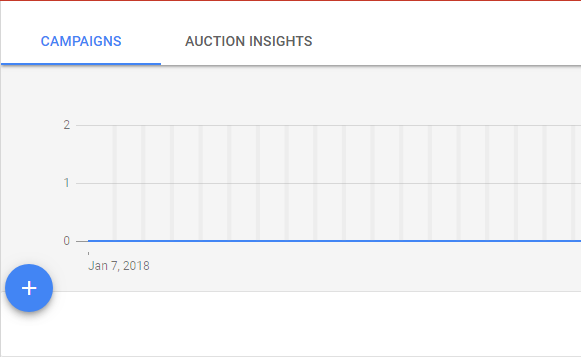 Always start with a low amount and based on the results you get, you can keep increasing the bidding amount. Do remember that the bidding price you set is not the actual price you will be paying will be lesser. It is about one penny above the second lowest price. The best way to do this is to choose a maximum value you are comfortable with based on your campaign budget but this value should not be low so that a few fluctuations in the budgets of your competitors affects your results. Cost Per Acquisition– you achieve the desired result. Like for a website traffic campaign, you will pay when someone clicks the link and visits your website. Maximum Cost per view– the maximum cost you are willing to pay when someone watches your video ad. Maximum cost per mille– the maximum amount you wish to pay for a thousand video views. Viewable cost per mille– Your ad becomes viewable when it has played for at least 50% of the ad plays on the screen for 2 seconds or longer. This amount will be the maximum you are willing to pay for 1000 viewable impressions. Cost per view is the most popular option that is chosen. Based on your brand guidelines, there might be some places where you would not wish for your ad to show. 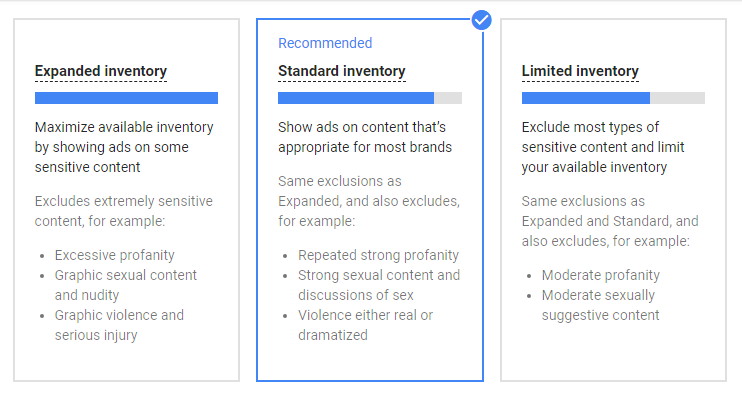 You have the option to input these as content exclusions and define where your ads will not be shown. This is known as selecting inventory type. You can click on the “compare inventory type” option to know more in detail about what is included and excluded in each option. Further, you can also select digital content types and labels you wish to include. Step 11) Select the devices you wish to feature your ad on. Step 12) Choose how many impressions and views you wish to show your ad to each user either per day, per week or per month. Also, select an ad schedule for your ads to run. Create and name your ad group. You can laser target your audience based on gender, age group and parental status. In some countries, you can also choose to target your audience based on their household income. Furthermore, spend a lot of time targeting your audience based on their detailed demographics, interests and habits, life events etc. The option for retargeting your audience is also available. A highly beneficial feature of YouTube ads is that you can target your audience based on the keywords they use to search for your products or products similar to yours. Another great feature of YouTube ads is that you can choose on which YouTube channels your ad can feature. Step 14) Connect your ad to your campaign by placing the URL of the video and you are all done. Always ensure you use high-quality videos for your ads as quality matters. If you are using YouTube ads to promote your own channel, it would create more credibility if you can be present in person in your channel ad. This is known as the “Talking Head” format. You can even use your smartphone to create such videos. Running your ads on channels that are popular in your own niche results in higher engagement rates as they end up being more relevant. Use appropriate calls to action in your advertisement. Keep it short, simple and engaging. These are some leaderboard ads as per Brand Equity which were highly successful and were shared over and over again in India in 2017. This ad was so well received by the audience that it received over 100 million views. It has a motivating and heart-touching story which won so many hearts by connecting with the audience on an emotional level. Deepika’s Goibibo ad which received 18million+ views has been a huge hit on YouTube in 2017. The humour in this ad is based on the generation gap and something all of us can relate to. Hence the ad’s popularity. It is estimated that India will have about 500 million monthly active users on YouTube by the year 2025. Today, about 1.5 billion people all over the world watch over 5 billion videos per day, which means about 1 billion hours of videos are watched per day. A lot of advertisers also believe that Google Ads combined with YouTube ads makes a very powerful combination. If, as a brand, you haven’t experimented with video content or YouTube ads, the time to do so is now.